We are concerned with today's existential questions. In the contemporary materialist culture, the answer is in materialistic terms. Do we still need religion? And within this debate a more fierce debate exists between religions (e.g. Christianity, Islam, Judaism, Buddhism, Hinduism.) Inside the religious debate, there is a dialogue between confessions (e.g. Catholics, Orthodox, Protestants in the Christian faith.) So where do you find your existential meaning? Today I turned 65. I am blessed by my beloved Lord, God, and Saviour Jesus Christ for everything that he gave me since my conception in the womb of my mother. I thank the all-merciful loving God for the many graces that he gave me to sustain me whether spiritually, physically, or psychologically. I thank God for my father and my mother, both of blessed memory, who sacrificed much for me and my brothers...I thank you my God for my wife who has always been with me, and my children who take care of my needs. I thank you for my brothers and sisters-in-law, for their sons and daughters and their families. I thank you my God for the great doctors that gave me their best talents and care when I needed it, for their assistants, and for the nurses who cheerfully served me when hospitalized. I thank you Jesus for the great spiritual directors who guided me and those of them who continue to guide me. I recall here the late Bishop Paul Antaki the Great who influenced me in my youth days as well as the Jesuit scholars Fr. Henri Boulad and Fr. Samir Khalil Samir, Msgr. Robert Nusca, Fr. Daniel Callam, Fr. Georges Farah, Most Reverend Bishops Ibrahim Ibrahim, Joseph Jules Zerey, Georges Bakar, Cardinal Thomas Collins, Fr. Magdi Allawi, and many other priests, scholars, and researchers who influenced me. I thank you for the youth and students that I taught at Jesus the King parish and their leader who gave me a great gift in January 2007. 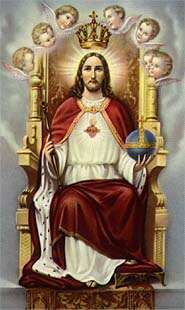 I thank you too for older adults who listened to me at Jesus the King and follow my posts here. I thank you for the Knights of Columbus who helped me in their charitable work especially for Christians in the Middle East as well as your servants at the Catholic Near East Welfare Agency, The Church in Need, and other Christian organizations that serve many persecuted Christians in Africa, and Asia. One of the most delightful online Catholic ministries is called "Focus Ministries for Catholic University Students" (here). They are an example of what could come out of young thoughtful Catholics. Pastors and their assistants may wish to use them as tools in conducting workshops for young adults and university students. This is a historic week. This week we’ve observed the anniversary of the death of Pope St. John Paul II. We’ve also seen the Church release the Apostolic Exhortation “Christus Vivit,”or “Christ Lives” (CV). In the opening paragraphs, Pope Francis states that “With great affection, I address this Apostolic Exhortation to all Christian young people. It is meant to remind you of certain convictions born of our faith, and at the same time to encourage you to grow in holiness and in commitment to your personal vocation” (CV 3). This Apostolic Exhortation was born following his time of reflection and prayer in October 2018 with bishops throughout the world during the Synod on Young People, Faith and Vocational discernment. “Christus Vivit” is a historic document: It’s the first-ever Vatican document on young people. Just last week, I was blessed to be with a group of Church leaders in the United States. This group gathered to reflect upon the recent synod and the upcoming Apostolic Exhortation. 1. Jesus was a young person. Pope Francis writes, “It is important to realize that Jesus was a young person. He gave his life when he was, in today’s terms, a young adult” (23). This is a beautiful line for all young people to pray through. Jesus, our savior, took on human flesh and walked among us. He grew up and lived as a young person and even gave his life at the age of 33, as young adult man. As Christians, we are called to imitate Jesus. This is a call to total self-giving; it is not something that we should wait to answer until we are old, but something that especially starts in our youth. Pope Francis is inviting the youth of the today to live with that same sacrificial love. 2. We’re called to return to the source of youth. Young people are called to be leaven in the world — but we cannot be leaven without first being filled with Christ. We need to turn repeatedly to attending Mass, praying daily, reading the Bible and asking for Mary’s intercession. It is here that we will find the strength to be ever renewed in Christ and be a joyful presence in the world. The Holy Father says that “we must dare to be different, to point to ideals other than those of this world” (para. 36). Our ability to point to these ideals comes from Christ, and only in Jesus will the human heart find peace, joy and freedom. At the end of the second chapter of “Christus Vivit,” Pope Francis offers a litany of young saints that young people should emulate and request the intercession of today. He mentions St. Thérèse of Lisieux, Blessed Chiara Badano, Blessed Pier Giorgio Frassati, St. Dominic Savio and St. Kateri Tekawitha, among others. These are great saints for young people and all Christians to befriend today and ask for their intercession for the youth of the world. We should especially ask these saints to help us to become saints ourselves. At the end of his litany, Pope Francis writes, “May these and so many other young people who perhaps in silence and hiddenness lived the Gospel to the full, intercede for the Church, so that she may be full of joyous, courageous and committed young people who can offer the world new testimonies of holiness” (63). We live in a time that needs saints more than ever. There are many challenges of our times in and outside of the Church — but these crises can only be addressed by living out a holy life. Now is the time to be holy: We cannot put this on our “someday, maybe” list. Holiness cannot wait. God created each of us to be fully alive in Him. As Pope Francis said, “The very first words, then, that I would like to say to every young Christian are these: Christ is alive and he wants you to be alive!” (1). The Apostolic Exhortation "Christus Vivit" (Christ Lives) by Pope Francis was released on March 25, 2019 just in time as this week we celebrate Pope Saint John Paul II who departed to God on April 2, 2005. In it, Pope Francis reflects on the meaning to be young and takes the example of Christ himself to remind us that we should never become sterile in the service of Him who served everyone, accepted death so that everyone may have life of eternal joy with Him, and rose from the dead to bring us to heaven. Most impressive to me was Francis' reflection: As a Church, may we never fail to weep before these tragedies of our young. May we never become inured to them, for anyone incapable of tears cannot be a mother. We want to weep so that society itself can be more of a mother, so that in place of killing it can learn to give birth, to become a promise of life. We weep when we think of all those young people who have already lost their lives due to poverty and violence, and we ask society to learn to be a caring mother. None of this pain goes away; it stays with us, because the harsh reality can no longer be concealed. The worst thing we can do is adopt that worldly spirit whose solution is simply to anaesthetize young people with other messages, with other distractions, with trivial pursuits. Once upon a time, when animals still talked, the mice on a farm called a summit of all the other animals. They were worried, they lamented, because they had seen the mistress of the house buy a mousetrap. They were now in danger. But the other animals scoffed at their anxiety. The cow said that she had nothing to worry about. A tiny little contraption couldn’t harm her. She could crush it with her foot. The pig reacted in a similar way. What did he have to worry about in the face of a tiny trap? The chicken also announced that it had no fear of this gadget. “It’s your concern. No worry for me!” it told the mice. But all things are interconnected and that soon became evident. The mistress set the mousetrap and, on the very first night, heard it snap. Getting out of her bed to look what it had caught and she saw that it had trapped a snake by its tail. In trying to free the snake she was bitten and the poison soon had her feeling sick and running a fever. She went to the doctor who gave her medicines to combat the poison and advised her: “What you need now to get better is chicken broth.” (You can guess where the rest of this is going.) They slaughtered the chicken, but her fever lingered. Relatives and neighbors came to visit. More food was needed. They slaughtered the pig. Eventually the poison killed her. A huge funeral ensued. A lot of food was needed. The slaughtered the cow. The moral of the story is clear. Everything is interconnected and our failure to see that leaves us in peril. Blindness to our interdependence, willful or not, is dangerous. We are inextricably tied to each other and to everything in the world. We can protest to the contrary but reality will hold its ground. And so, we cannot truly value one thing while we disdain something else. We cannot really love one person while we hate someone else. And we cannot give ourselves an exemption in one moral area and hope to be morally healthy as a whole. Everything is of one piece. There are no exceptions. When we ignore that truth we are eventually be snake-bitten by it. I emphasize this because today, virtually everywhere, a dangerous tribalism is setting in. Everywhere, not unlike the animals in that African tale, we see families, communities, churches, and whole countries focusing more or less exclusively on their own needs without concern for other families, communities, churches, and countries. Other people’s problems, we believe, are not our concern. From the narrowness in our churches, to identity politics, to whole nations setting their own needs first, we hear echoes of the cow, pig, and chicken saying: “Not my concern! I’ll take care of myself. You take care of yourself!” This will come back to snake-bite us. We will eventually pay the price for our blindness and non-concern and we will pay that price politically, socially, and economically. But we will even pay a higher price personally. What that snake-bite will do is captured in Von Balthasar’s warning: Whoever ignores or denigrates beauty will, he asserts, eventually be unable to pray or to love. That’s true too in all cases when we ignore our interconnectedness with others. By ignoring the needs of others we eventually corrupt our own wholeness so that we are no longer be able to treat ourselves with respect and empathy and, when that happens, we lose respect and empathy for life itself – and for God – because whenever reality isn’t respected it bites back with a mysterious vengeance. The parable of the Prodigal or wasteful Son is more about the loving Father. God is not a raging tyrant who must be appeased through the suffering of his Son. Rather it’s the extravagant love of Jesus, son of the extravagant Father, that makes atonement for our sins – the sacrifice of a spotless Passover Lamb. For our sakes, God made him who did not know sin to be sin, so that in him we might become the very holiness of God” (2 Corinthians 5:21). Some Christians reading these words over the last few centuries have gotten the wrong idea. They’ve put this Scripture together with Jesus’ cry from the cross “My God, My God, why have you forsaken me.” Plus they’ve added to the mix the Apostle’s Creed assertion that Jesus “descended into hell.” The result is a huge misunderstanding. It goes something like this. The sin of the human race called down the punishment not only of physical death and suffering but also spiritual death, total separation from God which is what hell is all about. Jesus bore this punishment in our place. This means that he took our sins upon himself to the point that he actually became sinful and abhorrent to the Father. He was thus truly abandoned by God on the cross and spent three days in hell, with the rest of the damned. Let’s unravel this wrongheaded idea. Elsewhere I’ve discussed the true significance of “My God, My God, why have you forsaken me.” In this post, we need to clear up the other two misunderstandings. First, there is 2 Cor 5:21. In Hebrew, the same word means both “sin” and “sin offering,” What Paul is really saying is not that Jesus became sinful, but that he became a sin offering. This kind of sacrifice was understood as compensation or restitution to God to make up for offending him through sin. Honor and glory that God deserved had been withheld from Him; in the sin offering, perfect, costly animals, the most valuable possessions of the typical Israelite, were paid back to God in reparation and atonement. The Passover Lamb had to be perfect, without blemish, and his bones could not be broken (that’s why Jesus legs were not broken on the cross like the legs of the two thieves, John 19: 32-37). Jesus did not become sinful; he was the Lamb of God who took away the sins of the world by canceling them out through a sacrifice of overwhelming value. His self-offering was an extravagant gift. It consisted of all the love, humility, and obedience that centuries of human beings owed to God but had unjustly withheld from him. The Father is not a blood-thirsty tyrant whose wrath is appeased by the suffering of Jesus. 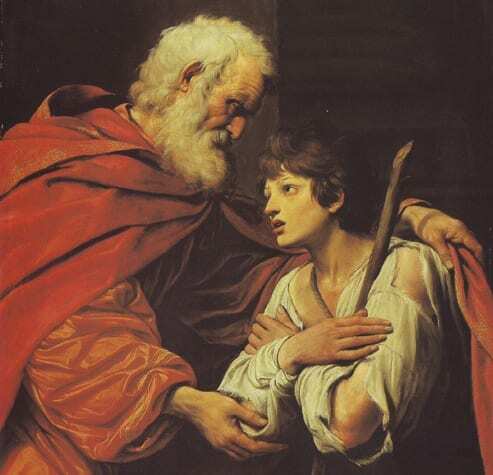 He is the loving Father in the story of the Prodigal Son who respects his son’s freedom too much to force him to stay, or to send a posse after him once his sins led him to the brink of despair. The Prodigal Son walked away in arrogance. He would himself have to travel the road back in humility. Adam, Eve and all of us walked away in pride. We, their sons and daughters, would have to walk back in humility. Trouble was, we couldn’t, so deeply had we been wounded by sin. So God became man and walked the road for us, though it turned out to be the way of the cross. Perfect humility. Perfect love. Perfect suffering. Relentless and undeterred by every conceivable stumbling block and snare that hell could put in its way. That is what redeemed us and paid the debt of our sins. But what about the phrase in the Apostle’s Creed “he descended into hell?” The word used for hell means not the inferno of the damned (Gehenna), but the abode of the dead known as Sheol, Hades, or Limbo. The meaning of this is simple– he really experienced the separation of his soul from his body. It was no drill. He really died. For us. For me. It was love to the bitter end. So Jesus is the conquering hero, not a passive scapegoat. His free gift of unconquerable love is what makes atonement for our sins. And the Father rushes out to meet him in love, clothing him (and us) with the resurrection. The passion, then, is all about love. For God so loved the world that he sent his only Son who would lay down his life for not only his friends, but even for his enemies. This blog is for YOU! Reflect, think and comment on what you see! Open the doors to Christ! Modern Catholic Dictionary by John Hardon, S.J. Catholic Resources - Felix Just, S.J. Magis Center (Robert Spitzer, S.J., PhD. Pierre Teilhard de Chardin, S.J. Sacred Texts Archive (Internet) - Authors Not Checked! Originally from Lebanon, and born in Egypt. Lives in Toronto, Canada. Happily married and blessed with 3 children. Member of the Catholic Church. In 1978, was appointed by Archbishop Paul Antaki to lead 250 young adults in the Melkite Catholic Church, Egypt. In Toronto, 1996 started the Family/Biblical Catechism at Jesus the King Melkite Catholic parish. In 2002, organized the first Conference of Eastern Catholic Churches in Toronto, hosted at Jesus the King parish, which was followed by the second Conference in 2008 at the same parish. Member of the parish's Church Council since 1998, has been in charge of spiritual lectures assisting the pastor Fr. Dr. Georges Farah, and inviting speakers for lectures. Since 2001, has been in charge of the Church library. Since 2004, has been lecturing to adults and young adults in theological, social and scientific disciplines at Jesus the King parish. In October 2010, spoke in the interfaith meeting of youth at Jaffari Islamic Centre from a Catholic Christian perspective along with expert speakers from Islamic perspective and Hindu perspective on the topic of Angels and Demons. Knight of Columbus since 2010.